"Love knows no distance." The statement holds true when your brother is living miles away from you but you two still never fail to show care and concern for each other. Send Rakhi to Kolkata and let your brother know he is the greatest pillar of strength in your life. Rakshabandhan, the auspicious celebration of the eternal bond between a brother and a sister, is right around the corner. And most definitely it is the time to bring a smile on the face of a loving brother who lives in the city of rosogullas; that is Kolkata. The Rakhi that you need to send to him has to be as sweet as white syrupy dumplings. But, to make a choice seems like a task, that too in the chaotic days of festivities when the markets are bustling with the scuttle. Do not worry at all, and send Rakhi to Kolkata online through our online Portal. At FlowerAura we have plenty of options, where you can choose the choicest threads. Along with love and some splendid rakhi for brother you can send flowers, chocolates, dry fruits even cakes of your choice to the heritage city of Tollywood and Trams. Siblinghood is a magical bond that retains its purity, despite continuous fights, nuisance, and sudden patch-up. To foster this amazing bond of care among siblings overlooking distance we are here with our online rakhi delivery to Kolkata with same day rakhi delivery in Kolkata option available. 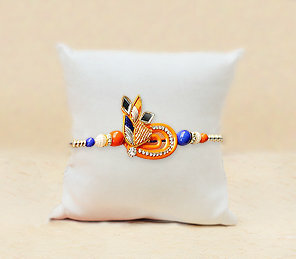 All you have to do is to simply log on to FlowerAura.com, explore our collection of handpicked collection rakhis which are made of different materials (Kundan, American diamond, pearl, chandan, rudraksh, gemstones, silver, cartoon rakhi for kids), after choosing the preferred one you can place the order, our services include free shipping. You can adorn the rakhi pack with all the accompaniments, like roli tikka, Rakshabandhan special gifts, and sweet combos. Rakhi with chocolates will be a great idea if your brother is a sweet lover apart from that we have dry fruits and flowers for health conscious brothers. You would believe it only when you experience it, that rakhi delivery in kolkata through FlowerAura is as easy and delectable as tasting a white spongy rosogulla! We will ensure that your token of love reaches your beloved brother's doorstep on time through our free home delivery service. It is tough, without a doubt, when brothers and sisters live in different cities! Love and compassion crave for an expression, while the miles in between eat away the spirits. Yet, there always are some special occasions that help to pronounce the bonds with escalated spirits. Such are the festivities of Rakshabandhan, when sisters and brothers pour all the love, without holding anything back. For a brother in Kolkata, a city which is a daily festival of human existence in self, choosing the Rakshabandhan special gifts and sending rakhi online to Kolkata is a treat indeed for all the doting sisters. The exciting part is, all this and more is available at FlowerAura.com, and that too at just a few clicks. You can opt instant delivery if you are late in online rakhi in Kolkata where your dearest brother resides with just a few clicks of mouse. Weave some enthralling stories while you order Rakhi with dry fruits online, and embellish it with Rakhi gifts and send them with all your love to the sibling who awaits your endearments. Wish you a Happy Raksha Bandhan. We know you are quite far off from your brother and find it difficult to maintain the bond with him like you used to during your childhood days. You grew up and both flew to different cities leading to lesser communications. Besides, celebrating Rakshabandhan together got difficult due to the distance. But not that you have FlowerAura, be all set to celebrate the charm of the occasion with online Rakhi delivery in Kolkata from USA, UK, Australia, Canada, UAE, Dubai, Germany, Singapore and Saudi Arabia. With an extensive assortment of Rakhis at FlowerAura ranging from Zardosi Rakhi, Pearl Rakhi to Diamond Rakhis and Rakhi sets, find it all at FlowerAura with an ease of sending your love on Rakshabandhan in the form of love-filled Rakhis. The super smart express delivery is what made FlowerAura hugely popular as the best online gift destination. So this Rakshabandhan, send Rakhi to Kolkata from USA, UK, Australia, Canada, UAE, Dubai, Germany, Singapore and Saudi Arabia and let your brother know that he is always in your heart, despite the distance. Show him how much he means to you with scintillating Rakhis from FlowerAura. Both my orders were delivered on time i.e before rakhi, on 17th Aug. I am very happy with the services of Flower Aura. Best wishes. Items are not expecting mark. I was little dissapointed because i had to chase courier company to ensure rakhi and chocolate box is delivered on time as they didnt contacted the consignee to locate address,simply updated on their site unable to locate address. If i have booked rakhi with floweraura i expect them to follow up with courier company but i was dissapointed.